According to cloudflare, my blog traffic this month. According to google analytics, my blog traffic this month. a) Cloudflare is counting requests to my server (each image, each file, each style sheet) whereas Google Analytics is joining requests from the same visitor into a session. What can we infer from this? 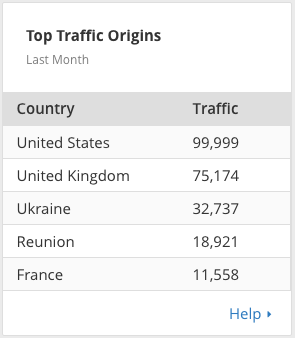 Computers in Ukraine that are visiting the blog aren’t reading this text, but they visit a lot. We cannot state with certainty the users instigating this are in Ukraine though, just that the requests can be traced as far as there. 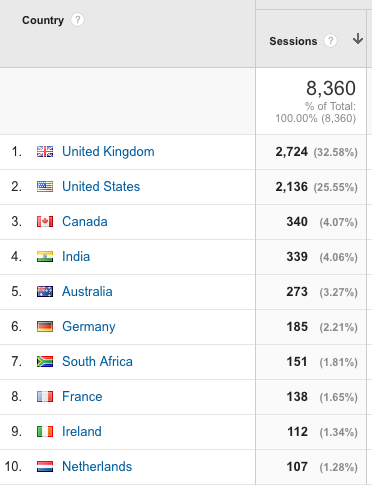 Likewise, computers in the USA requesting items from my server are less likely to be people than computers in the UK. My guess of the reason for this: Hacking attempts, search engines. You cannot tell from the source (eg: Ukraine) that the people controlling the computer requesting files [be that hacking or search engine or other uses good and bad] are in Ukraine. For example, for a long time my web server lived in Paris, but I’m not in France to control it. How many 1st class stamps to use on heavy letters? sroot on How many 1st class stamps to use on heavy letters? AZU on How many 1st class stamps to use on heavy letters?